Long time o...Happy Friday!I know, its been sometime since my last post...a lot has been happening and the protective style allowed me to focus on more important things. 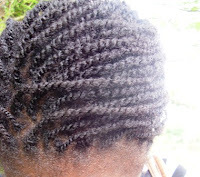 Let me start my saying that Loose twists are great!! It took me 3 hrs to do my whole hair and less to loosen. Maintenance was super easy and detangling after take down was just as easy as the video said it would be. Below are some pictures of the twisted mane. 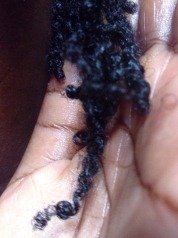 By day 3 the twists got thicker and my ends began to coil up. Last week,I did not feel like styling every morning so I put the twists in a loose French braid (what we call deedee), and this week, in a bun. It rained two days ago and I almost got caught in it. Unfortunately, I was close to a construction site and the winds blew a lot of dust into my hair and I had to take down the twists. 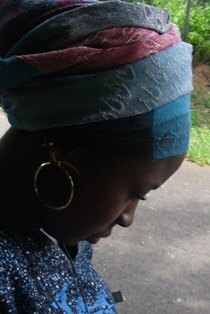 So I'm back to head wraps. I'm thinking of doing this style again because it was so low maintenance; no daily spritzing, no worries about styling,and my ends stayed in good condition all through because I kept them tucked in and well protected by applying the whipped Shea butter. 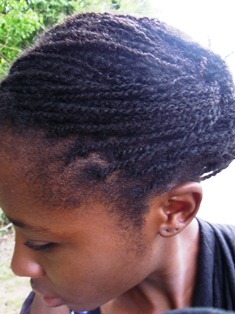 I know it looks old and frizzy, but if not for the rain, I'll still be in my twists by now. I really love your twists. Is it just me or do they look even finer as they got older? Maybe it's because of the bun you tucked them in but I love love love. Can't wait for my hair to be this long. Why didn't you have to spritz by the way? 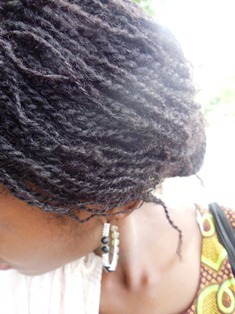 When I do protective styles without using extensions, my hair stays soft for as long as 3 weeks. The daily water/oil spritzing makes my hair hard. 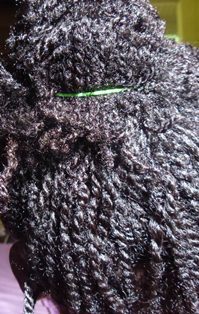 The hair strands would coil up (causing knots) and loosening the twists will be a problem. Trust me, I learnt this lesson the hard way. My hair is in twists 98% of the time. But they shrink and don't stretch like your. I guess its the difference in our hair. 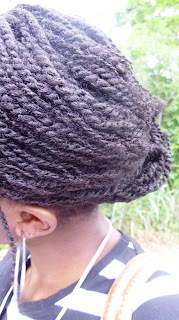 The twists looked great. 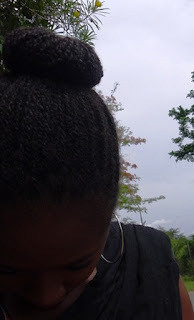 I really like the bun. Your hair looks fabulous in these twists. Isn't the versatility fantastic? I love the uniformity of each twist . . . this is actually something I wish my hair would do. Fabulous just fabulous! Thanks Funbi! I think you should try this style out before ruling it out. 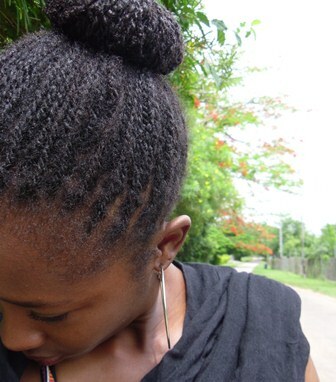 I used to run away from mini twists but I've found the hang of it now. 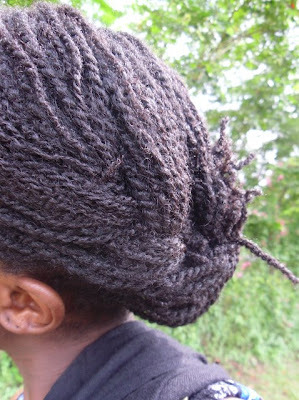 I keep my ends in and I apply Nibi's Shea butter that has water in it. Works well. I will try to do a tutorial but you could scroll down and find the Natural Belle's tutorial. I learnt how to from her. Thanks JazzWife...I'm your hair will look really beautiful in this style.